Country’s largest airline has set up a centralised unit to minimise disruptions. In a little corner on the fourth floor of the IndiGo headquarters, around 30 men and women are busy. They have a single objective -- to keep the airline’s fleet of 124 aircraft clear of any disruption during the foggy season, a nightmare for airlines around the world. To ensure that the airline can fly with minimal disruption, it has set up a centralised flight operation system in the Gurgaon-based head office from where the team controls everything from flight dispatch to scheduling and meteorology. “Here we try to minimise the impact of weather-related disorders and maintain the punctuality of the fleet,” said Jason Herter at operation control and dispatch, pointing at a screen which shows the weather forecast of all the 40 stations and additional ones that IndiGo flies to. This helps the airline to divert aircraft to locations when the need arises. The data is passed on to the fuel monitoring cell, which sits on piles of data to be utilised for giving guidance to pilots. “Basically, here we guide the pilot on load and trim, on how much fuel to carry, how much load to trim,” said Herter. The amount of fuel becomes significant during congestions at airports caused by fog. Often the pilot does not receive permission to land and has to hover over the airport, and, if necessary, fly to another location. “We are also in constant touch with the pilot through the Flight Following Cell text messages and short emails, passing on real-time information to make decision-making easier,” Herter said. Having a large fleet has its demerits for IndiGo. Delay or diversion of a single aircraft can throw the entire schedule of the day into jeopardy, resulting in more disruptions. 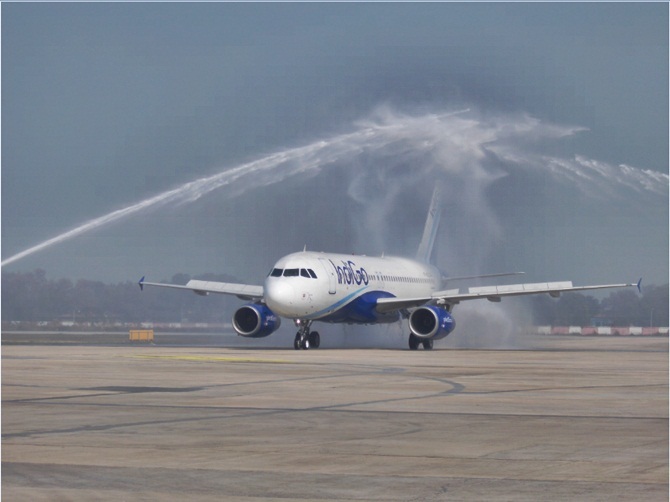 The fog that engulfs North India for almost 15 days in December and January has its maximum impact on an airline like IndiGo, which is based out of New Delhi and operates around 900 flights daily. According to a senior executive of a low-cost carrier, in a market like India, punctuality is something airlines build their brand around. For an average Indian flier, rather than the amenities inside the aircraft, it is the punctuality that matters. He is not ready to pay a lot for comfort but will select an airline which he hears is disciplined. “We have invested in systems to ensure our reliability. All our aircraft are now CAT-III B compliant and also have a technical dispatch reliability ratio of 99, which basically means there is negligible chance of the aircraft being delayed by a technical snag,” an airline official said. Every six months the pilots undergo simulator training for low-visibility flying. “I wish that many more airports in India were CAT-III compliant, though we may have trained pilots and equipped airplanes, we will not be able to operate due to airport constraints,” IndiGo President Aditya Ghosh said. To be sure, the preparations have not been able to insulate IndiGo from the gruelling consequence of fog. “December 2 was a bad day, we had a few flights diverted, but rest of the days have been absolutely fine,” Herter said.